Steady rain fell most of the day, the track changing from muddy to sloppy for the main event, with a post time temperature of 56 degrees. As expected, undefeated juvenile champion Nyquist was the prohibitive 7-10 favorite off wins in the Florida Derby (G1) and Kentucky Derby (G1). In to challenge him included 5-2 second choice Exaggerator, winner of the Santa Anita Derby (G1) before finishing second to Nyquist at Churchill Downs, and 8-1 third choice Stradivari, winner of two straight by open lengths and making his stakes debut here. Exaggerator draws off down the stretch. 34-1 Uncle Lino went to the lead immediately setting up a speed battle up front with 51-1 Awesome Speed on the outside and Nyquist in the middle. The three clicked off blistering early fractions of 22.38, 46.56, and 1:11.91 over the sealed sloppy main track. Entering the lane, Nyquist inherited a short lead getting the mile in 1:38.19, but Exaggerator, 8th early on a ground-saving trip around both turns, was switched to the stands side by Kent Desormeaux for clear run. Exaggerator surged to the lead inside the 3/16 pole, opening up by 1 1/2 lengths at the 1/8 pole while lugging in. Kept to task by Desormeaux, Exaggerator cruised to a 3 1/2 length win in 1:58.31. 17-1 Cherry Wine, 10th early under Corey Lanerie, put in a strong inside rally to nose out Nyquist for the place. 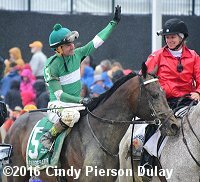 Left: Kent Desormeaux celebrates as Exaggerator parades for the fans. Winning jockey Kent Desormeaux said, "I can't fathom it. It's going to take a while. I'm in shock right now. I think Nyquist had company all the way around the course and stayed really wide, and I had a dream trip today. I was on the fence and they all stayed wide. I was able to inch forward and gain on the leaders slowly and quietly. From the 3/8 to the 1/4, I was slowing him down, waiting. He felt like King Kong. When I pitched him out, he exploded. With these turns you want to paint the fence. We did, they didn't and, not for nothing, knowledge is power." 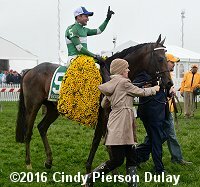 Right: Exaggerator parades with his flowers. 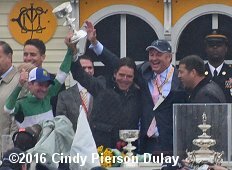 Left: The trophy celebration with jockey Kent Desormeaux, trainer Keith Desormeaux, and owner Matt Bryan of Big Chief Racing. 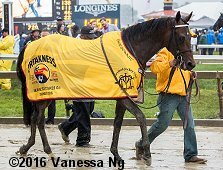 Winning trainer Keith Desormeaux said, "The horse has been training phenomenally. I think there was a conscious decision on the training approach between the Derby and here. My philosophy was to take it as easy as possible because you're not going to gain any fitness in those two weeks. I did what I could to get him happy and fresh and strong, and I've always said he had a great ability to recover. He showed it today." Right: Exaggerator heads back to the barn after the race. Left: Exaggerator walks over from the barn before the race. Keith Desormeaux added, "It's an American classic for a reason. To finally get to win one, it's kind of hard to describe. What I'm feeling now is awesome confirmation of a lifetime of dedicating myself to finding and getting the best out of a horse. We'll head north and settle in at Belmont. And we can't wait to run in that race." 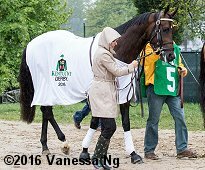 Right: Exaggerator heads over to the infield saddling area. Left: Second place finisher Cherry Wine returns after the race. If you click for the large photo you can see the blood over his eye where he hit his head in the starting gate. 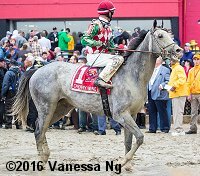 Trainer Dale Romans said, "I'm proud of my horse and proud of Corey (Lanerie, jockey). 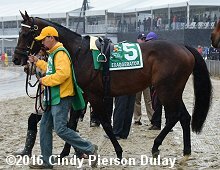 Exaggerator looked great all week and Keith did a good job with him. It's a special thing, two brothers in a classic like this. That's the special thing about the sport: It proves it's a family affair." Lanerie added, "They rode around and let them come to us, and he started to show his kick in the middle of the turn at the 3/8 pole. We did not encounter any trouble. We had pretty clear sailing. This one feels good." 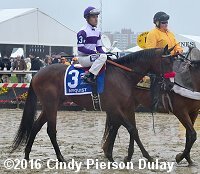 Right: Third place finisher and beaten favorite Nyquist in the post parade. Trainer Doug O'Neill said, "If we're going to get beat, let's get beat being aggressive and not trying to get cute and get in trouble. 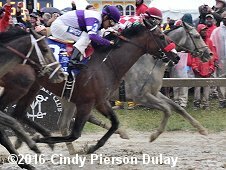 Exaggerator had that momentum, and Nyquist had done so much early in the race and just couldn't keep pace. He still gutted it out and almost held on for second. My hat's off to Exaggerator and Team Desormeaux. Nyquist is amazing horse and still ran a great race. He's still a champ in our book. These horses aren't machines. Being 8 for 8, I kept thinking this horse is never going to lose. They all lose at one time or another. He just didn't bring it today." The Belmont is a possibility for his next start.